Tonight after work, I will head back to the CLU, change, and go the gym. Death Class tonight, more on that topic coming. Now, with the big news at the beginning of the week with the approval for the ‘relaxed uniform’, it may me start to think. This morning I began to realize the options that follow. We all work hard here on base. There is a lot to do and it seems like every day here is a new event or a new project going on. The base is presently going over a massive expansion for the future. That is to be expected with the kinds of operation happening. All of the work during ‘working hours’ leads to some much sought after liberty. One thing that most all in the Navy enjoy – Liberty. Out of work, out of uniform, and free to do what you want until the morning. Yes, it is still called reveille, however, we don’t get the blaring trumpet. The alarm clock works just fine here. So wearing something other than a uniform after hours has been a big lift. The MWR building is small. Has WiFi, phones, a few computers, and a TV lounge. Every hour it is open, it is full. Very full. Sitting on the floor for space kind of full. Every outlet has a laptop plugged in, with more lurking next to it to jump on the next open circuit. Not a very comfy atmosphere, but good if you want to wait for the phones. That leaves me with the galley, the coffee house, or the club. I am not considering the Gym as it has no WiFi. Wait. Never mind. It could have the best bandwidth Al Gore ever dreamed of and I still am not sitting on a weight bench for 5 hours surfing the net. 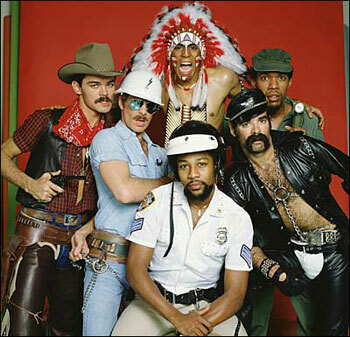 That just screams Village People songs all over it, combining two of their biggest hits (I know, the only HAD two). So that leaves three options. I can see now why the AFN network shows the subliminal advertisement that they do. They say we are all stressed out, high strung, drunk and overweight. Ok. Let’s see; after work I can hang out a coffee shop, a bar, or a place with all the free food I can eat. Making sure I have this correct. Granted, I can go back to the office and connect to the Internet there, watch a movie, etc. But, the whole idea of liberty after hours is to get away from work. Of course, this posting opens the door for all those to bark that I could have it worse, etc. Sure, I definitely could. There are worse places with heat and sand that I could be at. I could be underway and have less room to roam. However – I am not at either one of those places. I am here. Hopefully with this expansion, they consider a lounge of some sort. The biggest building here on base happen to be the bar. If they do consider that, maybe the ads might get better in the long run. "YMCA" or "In the Navy", either one get stuck in your head now.